Hummingbirds live life at incomprehensible speeds. Their flight acrobatics are amazing, maneuvering more like insects than birds as they flit around, flying upside down and even backwards. Hummingbirds live life at incomprehensible speeds. Their flight acrobatics are amazing, maneuvering more like insects than birds as they flit around, flying upside down and even backwards. They’re a blur as they race between flowers. When they do pause to visit a flower momentarily, they’re licking 15 to 20 times a second to extract their nectar fuel. Watch this speckled hummingbird (Adelomyia melanogenys) empty a flower in less than one second! What makes them so intriguing to us is the result of this simple dietary choice: they drink nectar. Each flower doesn’t offer a lot, so to make a living off tiny amounts of nectar spread throughout the forest, hummingbirds are tiny, fast and feisty. Feeding on nectar is hummingbirds&39; defining characteristic, but until now scientists didn’t know the exact mechanics of how they do it. In our new study, we were able to slow them down on video to see how they really drink nectar. And what we found was quite different from the conventional wisdom since the 1800s. Hummingbirds&39; skinny tongues are about the same length as their bills. They’re perfectly adapted for reaching deep into a flower. For over 180 years, scientists believed that to drink nectar, hummingbirds relied on capillary action. The idea was that their tongues would fill with nectar in the same way a small glass tube fills passively with water. The physics of capillary action relies on two forces. Adhesion of the liquid molecules to the tube walls makes the liquid climb the sides. Surface tension holds the liquid together and drags the whole fluid column upwards. The capillary action theory made sense since a hummingbird’s tongue has two tube-like grooves. It would be a simple, passive way for nectar to travel up the tongue. 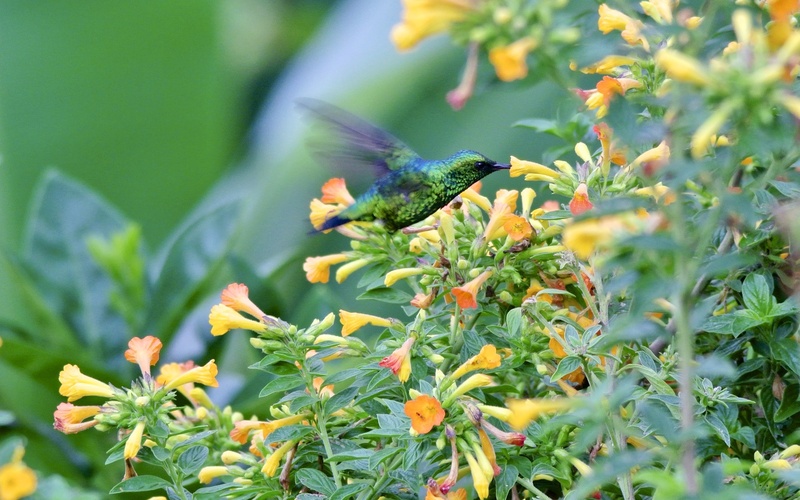 But from watching hummingbirds in my (Rico-Guevara’s) native Colombia, we felt that capillarity just wasn’t fast enough to keep up with how hummingbirds feed. We predicted that capillarity was too slow to account for the fast licking rates observed in free-living hummingbirds. Remember, they can drain a flower’s nectar with around 15 licks in under a second! Four years ago, one of us (Rico-Guevara) and colleague Margaret Rubega challenged the conventional beliefs about capillary action for the first time. We showed that the forked tongue tips are not static, but dramatically spread inside the nectar, with fringed edges that open up like tiny hands. When the hummingbird retracts its tongue from the nectar, these fringes close due to the physical forces of surface tension and Laplace pressure, trapping nectar drops in their grips. Due to this transformation of the tongue shape, the tongue tips don’t remain in the tube-shape necessary for capillary action. So how does the rest of the tongue fill with nectar? We set out to study a medley of hummingbird species to see what these birds were really doing at the flowers. We needed a way to measure a tongue’s thickness during the drinking process – straightforward, but not an easy task. We designed see-through artificial flowers that we filmed with slow-motion cameras. From these videos, we could then track the shape of the tongue throughout the whole licking cycle. The difficult part was convincing wild hummingbirds to drink on command. Over time, we trained them by habituating them to the phony flower feeders and our whole filming setup. When a hummingbird inserts its bill into a flower, it still needs to stick its long tongue deeper inside to get at the nectar within. After the tongue fills with nectar, the bird retracts the tongue back inside the bill. Researchers already knew that to keep the nectar inside the beak, the hummingbird squeezes the tongue with the bill tips as it is extended for the next lick. That compresses and flattens the tongue on its way out, leaving the nectar inside the bill. The way in which the nectar is moved from the bill tip to where it can be swallowed remains unknown. To study the tongue-filling mechanism, we focused on the flattened shape of the tongue that each lick starts with. If the hummingbirds were using capillarity, once the nectar had made it into the bird’s mouth, the tongue would immediately need to recover its tube-like shape before touching the nectar again. By closely studying our slow motion videos of the birds drinking at the transparent flowers, we saw that the tongue remained flattened after the squeezing even as it traveled through the air to reach the nectar for another sip. It didn’t snap back to its original pre-drink tube-like shape. 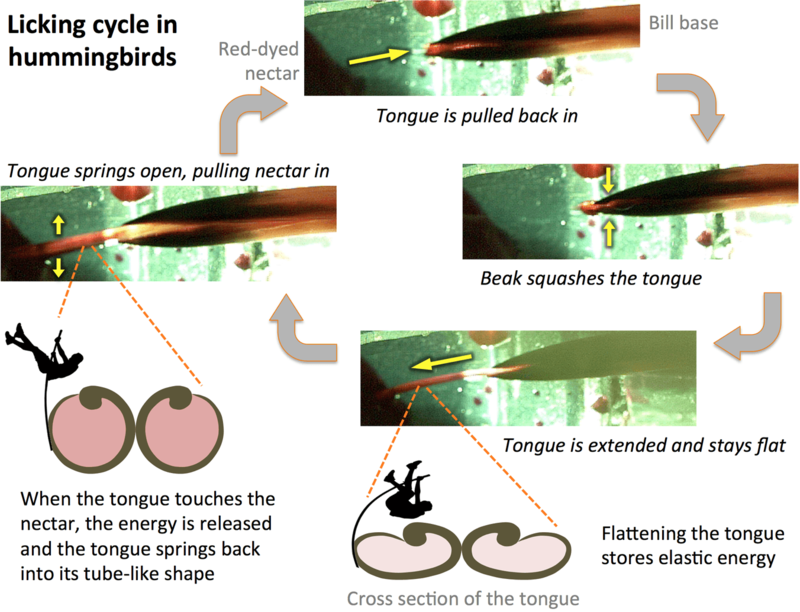 We studied 18 hummingbird species, and in hundreds of licks, we found that the tongue remained flattened until it touches the nectar. This was a key finding because it showed that the tongue didn’t have the empty space inside needed for capillary action to work. Finally, we can confidently rule out capillarity as important for hummingbird drinking. What we found goes beyond simply debunking capillarity. Hummingbirds have hit on an unexpected way to move liquid very quickly at this micro-scale: their tongues are elastic micropumps. The grooves in the hummingbird tongue don’t reach the throat, so the bird cannot use them as tiny straws. For this reason, instead of using vacuum to generate suction – imagine drinking lemonade out of a straw – the system works like a tiny pump, powered by the springiness of the tongue. The bird squashes the tongue flat, and when it springs open, this expansion rapidly pulls the nectar into the grooves in its tongue. 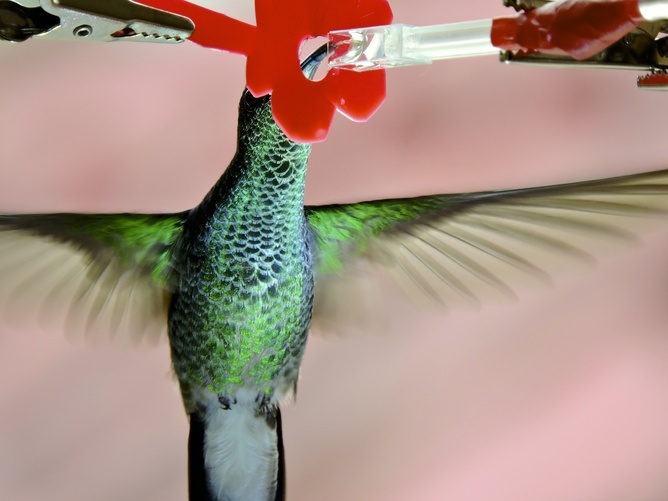 It turns out it’s elastic energy – potential mechanical energy stored by the flattening of the tongue – that lets hummingbirds collect nectar much faster than if they relied on capillarity. While the tongue moves through the air, the elastic energy loaded into the groove walls during the flattening is conserved by a remaining layer of liquid inside the grooves acting as an adhesive. When the tongue touches the nectar, the supply of fluid allows the release of the elastic energy which expands the grooves and pulls the nectar to fill the tongue. As biologists, we were excited by this new discovery, but needed the help of an expert in fluid dynamics, Tai-Hsi Fan, to accurately explain the physics of this hummingbird micro-pump, and to make new predictions. Our research shows how hummingbirds really drink, and provides the first mathematical tools to accurately model their energy intake. These discoveries will influence our understanding of their foraging decisions, ecology and coevolution with the plants they pollinate. Our ongoing research compares our new model with how much nectar hummingbirds drink at wildflowers, and looks at the trade-offs between drinking efficiently and fighting for dominance over territories either to attract females, to feed, or both.